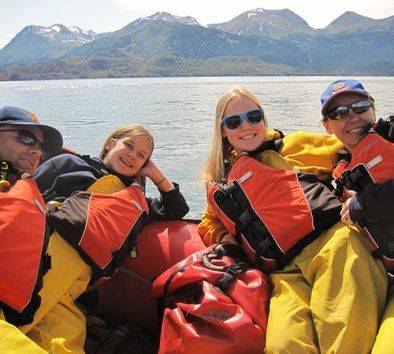 Spend a day exploring the Kenai National Wildlife Refuge on a thrilling Class II+ raft trip on the Kenai River. Nearly two million acres in size, the Refuge offers majestic wilderness scenery and multiple species of wildlife and birds. Your guide will steer your raft into Kenai Canyon and maneuver through the Class II+ rapids then pull ashore so you can enjoy a hearty picnic lunch. The Upper Kenai River terminates at Skilak Lake—a pristine, glacier-carved lake in the heart of the Wildlife Refuge. From Skilak Lake, you will either take a six-mile boat ride across the lake or a 1½-mile hike up the beautiful Hidden Creek trail where you get breathtaking views of the lake and surrounding mountains. Guests with back, neck, heart or mobility problems are not allowed to participate. Raft can accommodate up to ten guests. Time of raft is approximately 5 hours.